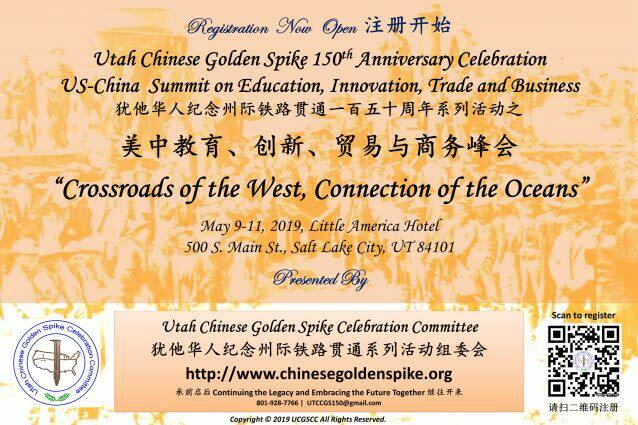 Registration Now Open: "Crossroads of the West, Connection of the Oceans"Utah Chinese Golden Spike 150th Anniversary Celebration.US-China Summit on Education, Innovation, Trade and Business.On May 10, 1869 in Promontory, Utah, the first transcontinental railroad across North America officially opened for through traffic with the driving in of the last "Golden Spike". Over 600 miles of the most hazardous part of the Central Pacific route was mainly built by more than 12,000 Chinese workers, the majority of whom were originally from the Canton province. They toiled in extremely harsh condition and accomplished a seemingly impossible mission. In total, nearly 2000 lives were lost during the railroad construction though this is likely an underestimate.This year marks the 150th anniversary of that historical moment. 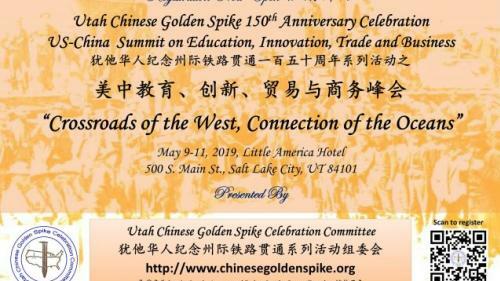 In honor of those heroic Chinese workers, in collaboration with many other communities and societies in Utah and across the country, the Utah Chinese Golden Spike Celebration Committee is planning a series of activities and events throughout the year, including rebuilding of the Salt Lake City Historical Chinatown, lectures about the contribution of the Chinese railroad workers, academic forums featuring the past, present, and future of Chinese Americans, attending the official Sesquicentennial Celebration at Golden Spike Historical Site, artwork exhibition which includes photographs, sculptures, paintings, and other artifacts, cultural performances on the history of construction of the Transcontinental Railroad; and special events for US-China summit on education, innovation, trade and business.With the hope that people of all racial and ethnic origins will come celebrate together, let us extend our most sincere invitation to all of you to join this US-China summit in May and celebrate with the local Chinese community together. Please also visit our website for series of activities and events throughout the year. http://chinesegoldenspike.org/.